This powerful icon of the Crucifixion from the first half of the 18th century is on the iconostasis at Iveron Monastery, Mount Athos. Carefully balanced, but dynamic in assymetry, the curves and lines of the Virgin, St. John, the Lord, and even the rocks and footstool give this composition strength to say in form that this event is still living and meaningful. 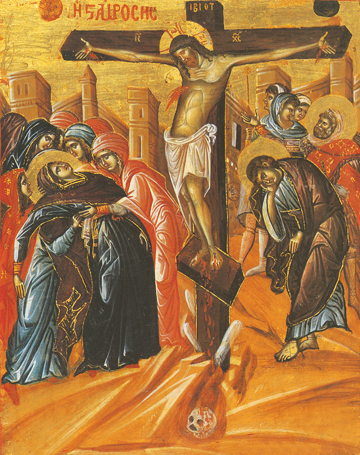 In Orthodox iconography there is a certain animate dynamism which symbolically represents the fact that at the end of time and the fullness of revelation of truth, all events from Christ’s life are eternal and meaningful, and all sentient beings who have chosen Heaven will continuously grow there forever. This is never static, but always dynamic. The Virgin Mary falls backward overcome by grief as she beholds her innocent Divine Son cruelly tortured and killed before her eyes. His Blood comes forth from His Side and flows down to cover Adam’s skull which Golgotha was named for, beginning the process of Adam’s rising again to Paradise in the Resurrection of the dead. The walls of Jerusalem are seen in the background. Who will weep for her now that they have rejected Christ?